One of the best parts about being a sports fan is arguing with other sports fans, and the best arguments usually center on the fans more than the sports. Arguments like: What does it mean to be a true fan? Say, for example, that one of the teams to which you are geographically, genetically, and/or cosmically linked goes on network television and leaps headfirst into an empty swimming pool, as most teams do from time to time.1 How does the true fan react? What’s the right outlet for the inevitable toxic swirl of adrenaline, rage, and impotence? What’s the best way to vent without putting your loyalty or personal property at risk? Ah, yes: A true fan supports the troops! That should fit nicely on the throw pillows here in the bunker. True Michigan fans are angry, of course, and the “kids” aren’t the ones in their crosshairs. As disappointing as last year’s 7-6 finish felt at the time, it was still possible for most supporters to greet the 2014 season with a sense of optimism. And why not? The offense, such a sore point in 2013, was in the hands of a new, well-regarded offensive coordinator from Alabama, Doug Nussmeier, who would benefit from having a versatile, veteran quarterback in senior Devin Gardner. At the very least, Nussmeier had to be better than the last guy. The defense, meanwhile, was also embracing a more aggressive philosophy designed to free up additional defenders against the run by employing more tight, bump-and-run coverage on the corners. A thorough, 52-14 rout of old nemesis Appalachian State in the opener seemed to vanquish any lingering sense of dread from the previous winter and reinforce the offseason tweaks. But all of that came crashing down in South Bend in about half an hour, or roughly the time it took the Fighting Irish to build a 21-0 lead. Gardner, who dropped four touchdown passes on the Irish in 2013 in arguably the best performance of his career, threw three interceptions and lost a fumble this time, all in the second half. 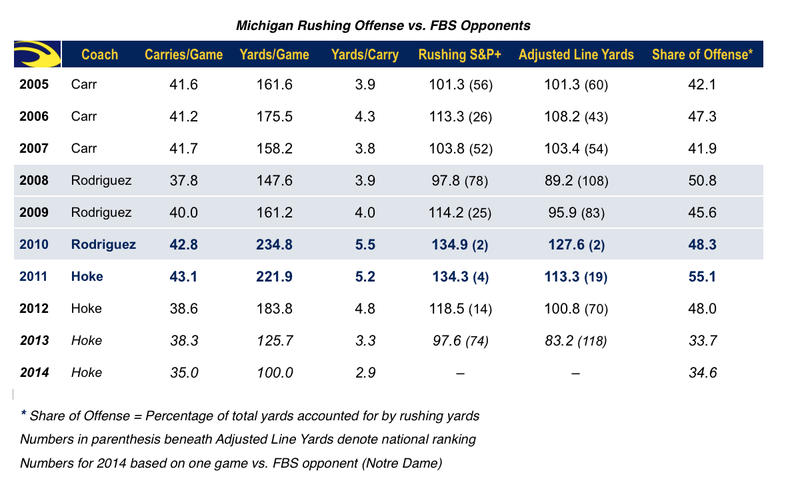 Including sacks, Michigan averaged 2.9 yards per carry. The defense yielded three extended touchdown drives in the first half and another in the third quarter, and failed to force a turnover. 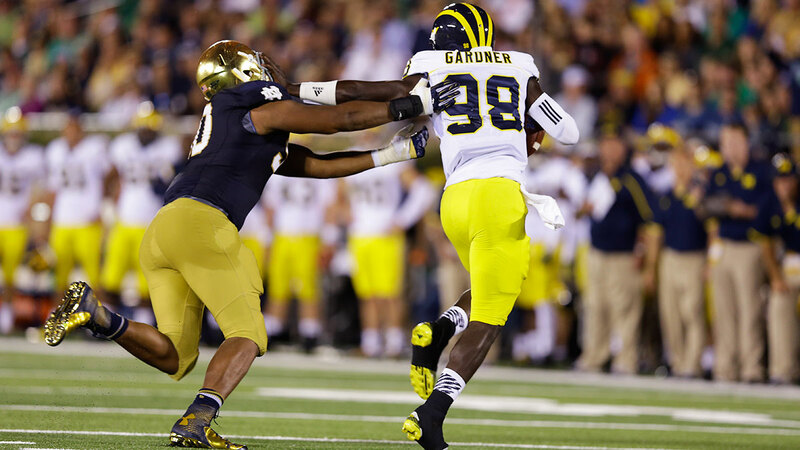 The denouement, which saw exiting Michigan players and personnel have to return from the tunnel to watch Notre Dame run one final play following Gardner’s third interception, seemed deliberately staged for maximum humiliation. By that point, the Wolverines had been going through the motions for most of the second half and the energy that had been slowly building for eight months had fermented into pure bile. A loss is a loss, and fans overreact after just about all of them. Where Hoke’s future is concerned, however, this particular loss felt like a Rubicon. By the time Hoke stood in front of the microphones on Monday to condescend to his base, the first ultimatum from a mainstream outlet had already been levied: Redeem the season by beating Michigan State and Ohio State — and presumably winning the Big Ten’s East Division in the process — or else. Meanwhile, speculation over possible replacements began. This is a population that knows frustration on an intimate basis. 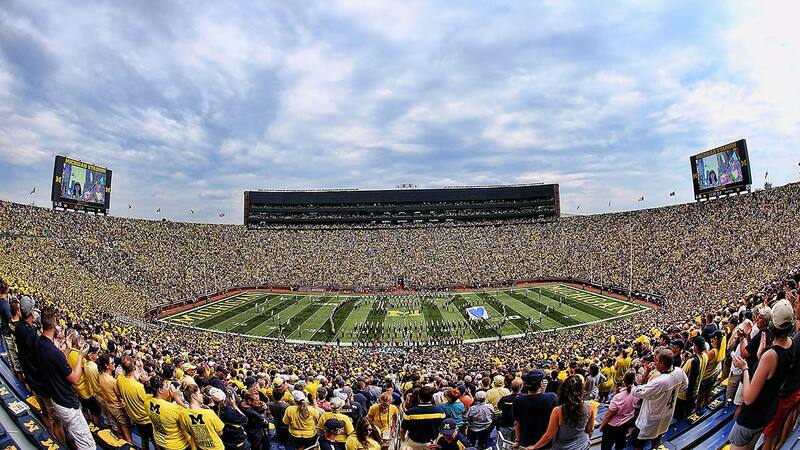 While Michigan retains all the trappings of an elite program — attendance, revenue, recruiting, “tradition” — the recent results have consistently suggested otherwise. The Wolverines haven’t won a Big Ten championship since 2004, the program’s longest title drought in 50 years. In the intervening decade since ’04, they’ve finished in the top 10 of the AP Poll just once, in 2006, and have finished unranked five times. They’ve dropped nine of the last 10 to Ohio State and five of the last six to Michigan State.2 Hoke’s tenure has unfolded as the inverse of Rodriguez’s: Where RichRod trudged forward from a 3-9 whimper of a debut in 2008, doomed from the start, Hoke has steadily squandered the goodwill of an 11-2 bang of a debut in 2011. Ultimately, they’ve converged in the same place. In Year 3 under Rodriguez, Michigan finished 7-6 with four losses in its last six games, capped by a deflating no-show in a perfunctory bowl game. In Year 3 under Hoke, Michigan finished 7-6 with five losses in its last six games, capped by a deflating no-show in a perfunctory bowl game. Following the flop against Notre Dame, there’s no reason to expect progress in Year 4. True fans have been patient for most of the past decade. Is this what they’ve been waiting for? It’s easier for an outsider to feel plugged in to the collective emotional state of Michigan fans than to any other college base because Michigan’s struggles have been so exhaustively documented. The undisputed leader of the online hordes is MGoBlog, which has dominated its niche by remaining equal parts articulate, exhaustive, and irascible for nearly a decade. Cook has a long memory and a self-consciously short fuse that only makes him more endearing the worse things get. Over time, as he has cultivated sources within the athletic department to go with a devoted audience, his opinion has gained the potential to shape the hive mind as much as it reflects it. On the big issues, MGoBlog has been ambivalent about longtime coach Lloyd Carr, disappointed but patient with Rodriguez, and increasingly frustrated with Hoke, whose tough talk is easily dismissed as a shibboleth in the face of diminishing returns. Cook has called 2013 “the worst football season I have ever experienced,” and (more memorably) likened watching that team unravel down the stretch to “get(ting) punched in the soul dong.” These days, however, Cook tends to reserve most of his venom not for the coach, but for the coach’s boss, athletic director Dave Brandon, who has raised ticket prices, piped artificial noise into Michigan Stadium, and embraced a succession of regrettable departures from the traditional uniform. And then there’s the more elusive set of values that Cook derides as “Michigan Man stuff,” by which he means not only a preference for the kind of anachronistic, cloud-of-dust philosophy that Hoke, Brandon, and many others revere as “hard-nosed, big-boy football” — in direct contrast to the newfangled spread offense favored by Rodriguez — but also an even more deeply ingrained sense of Michigan as a program that remains above the fray, doing things The Right Way. It was the persistence of this philosophy, in Cook’s estimation, that made it “mandatory” for Brandon to replace Rodriguez with a “Michigan Man” like Hoke, who’d spent eight years in Ann Arbor as an assistant under Carr, and that led award-winning columnists to write paeans to Hoke’s hard-nosed, big-boy pedigree under headlines like “Meat man Brady Hoke is the beef Michigan wanted.” (A small sample: “The three-year Rich Rodriguez experiment was like an avowed meat-lover going vegan because everyone says he should, until he finally spits out the bean curd and says, ‘Gimme a steak!’ … Hoke is a steak. He’s a porterhouse. A former linebacker, he is beefy in stature, beefy in voice … and beefy in Michigan tradition.”) In eight years as the top dog at Ball State and San Diego State, Hoke won 47 games and lost 50 while failing to earn a conference championship, but if his track record as a head coach seemed underwhelming, his rhetoric felt just right. Hoke’s players haven’t struggled to qualify or remain qualified — by Cook’s count, only two Hoke recruits have prematurely washed out of the program, neither of them due to academics — but they haven’t made much progress toward the hard-nosed, big-boy ideal, either. Quite the opposite: No area has deteriorated as quickly or dramatically as the running game, which ranked among the best in the nation in Rodriguez’s final season and currently ranks among the worst. Data from NCAA stats, cfbstats.com, and Football Outsiders. The Wolverines’ slobberknocking reputation under Carr was always a myth, but it was never so brazenly false that it became impossible to perpetuate. Last year, no one could have possibly been fooled. Michigan’s offensive line was a disaster for the ages in 2013, no small achievement considering that (a) both starting tackles, Taylor Lewan and Michael Schofield, were fifth-year seniors who were selected in the first three rounds in May’s NFL draft; and (b) Hoke’s recruiting efforts had focused first and foremost on improving the offensive line. By midseason, the interior line was in chaos; by Thanksgiving, six different starters had taken their crack at the guard and center positions alone, and the line never jelled into a single, predictable configuration. Against Penn State, starting tailback Fitzgerald Toussaint rushed 27 times for 27 yards. (Read that again, out loud if necessary.) Against Michigan State, the offense as a whole accounted for minus-48 yards rushing, due mainly to negative yardage on sacks; the following week, it improved to minus-21 yards rushing in a loss to Nebraska. For the season, the Wolverines allowed more tackles for loss (including sacks) than any other FBS offense. Against Notre Dame on Saturday, the Wolverines finished with more runs that ended in TFLs (eight) than ended in first downs (six), and didn’t break a single run longer than 15 yards. To the extent that they have a recognizable offensive identity, it’s as a unit going backward. Still, on some small, persistent, masochistic level, hope springs eternal. As he rewatched the Notre Dame debacle for his weekly play-by-play review, Cook concluded it was “really not that bad” given the final score — for what it’s worth, Michigan actually outgained the Irish overall, 289 yards to 280 — and says he “wouldn’t be surprised” if the Wolverines rebounded to go, say, 9-3 while playing in a watered-down conference. The schedule has gifted the Wolverines with an easy rebound, against Miami (Ohio) in Week 3. On the subject of Hoke’s future, Cook feels he’s “two standard deviations above the patience mean” compared to the rest of the fan base, in part because he doesn’t see any viable successors on the horizon. The defense was solid against Notre Dame’s ground game, at least, and the lapses against the pass were uncharacteristic for Michigan’s returning starters. Meanwhile, Gardner’s potential, while unfulfilled, remains undiminished, and oversize wide receiver Devin Funchess remains uncoverable against smaller DBs if the offense commits to throwing to him downfield. “Honestly, the offensive line played better in this game than last year,” Cook said, favorably comparing Saturday’s shutout to a game in which Michigan posted 41 points in a resounding victory. And hey, maybe Notre Dame is way better than anyone thought it would be coming into the season. After all, prior to their out-of-the-blue run to the BCS title game in 2012, the Irish weren’t even ranked. Or, maybe not. The ostensible standard at Michigan, year in and year out, is a Big Ten championship, but in the same division as Michigan State, Ohio State, and suddenly championship-eligible Penn State, even the suggestion of a conference crown is on the far side of optimism for a team that looks like it’s going to struggle to score on a weekly basis. Regardless, the “Rose Bowl or bust” outlook has felt more rhetorical than realistic for years, dating back to the devastating 2007 loss to Appalachian State that detonated high expectations in the last season in which they seemed legitimately warranted. “I don’t even know what successful looks like anymore,” Cook said. That dwindling sense of possibility gets to the heart of the malaise. At his introductory press conference in 2011, Hoke bristled at questions about the Wolverines’ national relevance by growling at reporters, “This is Michigan, for God’s sake.” At the time, it was the right kind of bluster for a program in the throes of an identity crisis, and for a guy who, like the vast majority of fans, remembered Michigan at its best, in the national championship season of 1997. Nearly four years after that declaration, though, the crisis has not abated, and in fact may have deepened. When Hoke says “This is Michigan” in 2014, the distance between the Michigan in his mind and the Michigan he’s selling to teenagers who were newborns when the Wolverines last wore the crown has never been greater. The teams that don’t typically aren’t good enough to be on national TV in the first place. The prospect of playing second fiddle to the Spartans has been especially sobering: While the rivalry with Ohio State has been a dead heat from the beginning, prior to 2008 Michigan had owned the series with MSU for 40 years. Arguably the most hyped signee of Rodriguez’s tenure, Demar Dorsey, was denied admission despite qualifying under minimum NCAA standards, and never put on a winged helmet. The definitive account of the RichRod era and corresponding turmoil is the 2011 book Three and Out, by John U. Bacon, which documents the personal feuds and internal politics of those years in minute detail. Bacon did not respond to an interview request for this article.